Another tendency that this drawing forecasts is the theatricality of much of Sonnier’s subsequent work. Critics have commented on the self-consciously dramatic presentation of some of his installations, the dance of the colored gases in their neon tubes, and their deliberate engagement with the spectator. The artist himself, in a recent interview, compares his work to a theater set and the act of making it to the experience of acting in a play.7 Sonnier, like Picasso, may see himself as an actor in the drama of his own art making, but in this drawing he functions more as a playwright or director, asking each of the three lamps to assert its individual character and perhaps inviting the audience to engage with his playful blueprint for experimentation in a new medium. 1. Robert Pincus-Witten, Postminimalism (New York: Out of London, 1977), 34. 2. “Drawing with Light” is the title of an article on Sonnier by Richard Kalina in Art in America 92 (April 2004): 114–19. In 1966, the year this drawing was made, Sonnier’s work was included in Lucy Lippard’s Eccentric Abstraction, a seminal exhibition for Postminimal art. 3. Keith Sonnier, in Patricia Rosoff, “Electrifying the Inert: A Conversation with Keith Sonnier,” Sculpture 25, no. 1 (2006): 57. 4. Kalina, “Drawing with Light,” 116. 6. Keith Sonnier, in Max Blagg, “Keith Sonnier” (interview), Interviewmagazine.com, May 2012, http://www.interviewmagazine.com/art/keith-sonnier/. Amanda Beresford is a native of Sydney, Australia and is a PhD student in the department of Art History and Archaeology at Washington University in St. Louis working on modern art and dance. She has worked as a curator in museums in Australia, England, and St. Louis since the 1970s and has published on Australian and European art, decorative arts, and Aboriginal art. Keith Sonnier (b. 1941, Mamou, Louisiana) earned his BA from University of Southwestern Louisiana in 1963 and his MFA from Douglass College at Rutgers University in 1966. Sonnier’s most recent solo exhibitions have been held at Mary Boone Gallery, New York (2008, 2010); Sadie Coles HQ, London (2008); Texas Gallery, Houston, Texas (2008); Häusler Contemporary, Munich (2008,2011); PaceWildenstein, New York (2008); Leo Castelli Gallery, New York (2009, 2011, 2012); Haüsler Contemporary, Zurich, Switzerland (2009); Galerie Jürgen Becker, Hamburg, Germany (2009); JGM Galerie, Paris (2010); Heriard-Cimino Gallery, New Orleans (2010, 2011); the Louisiana Art & Science Museum, Baton Rouge, Louisiana (2010); Bernier/Eliades Gallery, Athens (2010); Art Club 1563, Seoul, South Korea (2010); the New Orleans Museum of Art (2011); and Guy Pieters Gallery, Knokke, Belgium (2012). His most recent group exhibitions have been held at Robert Miller Gallery (2008); Mary Boone, New York (2008, 2009); Jonathan Ferrara, New Orleans (2009); Centre National d’Art Contemporain, Grenoble, France (2009); The Museum of Modern Art, New York (2010); The Pace Gallery, New York (2010, 2011); JGM Galerie, Paris, France (2011,2012); the Museum of Contemporary Art, Chicago (2011); La Maison Rouge, Paris (2012); and Guild Hall, New York (2012). Sonnier lives and works in New York City. Robert Pincus-Witten, Postminimalism (New York: Out of London, 1977), 34. “Drawing with Light” is the title of an article on Sonnier by Richard Kalina in Art in America 92 (April 2004): 114–19. In 1966, the year this drawing was made, Sonnier’s work was included in Lucy Lippard’s Eccentric Abstraction, a seminal exhibition for Postminimal art. Keith Sonnier, in Patricia Rosoff, “Electrifying the Inert: A Conversation with Keith Sonnier,” Sculpture 25, no. 1 (2006): 57. Kalina, “Drawing with Light,” 116. Kalina, “Drawing with Light,” 116, 119. Keith Sonnier, in Max Blagg, “Keith Sonnier” (interview), Interviewmagazine.com, May 2012, http://www.interviewmagazine.com/art/keith-sonnier/. 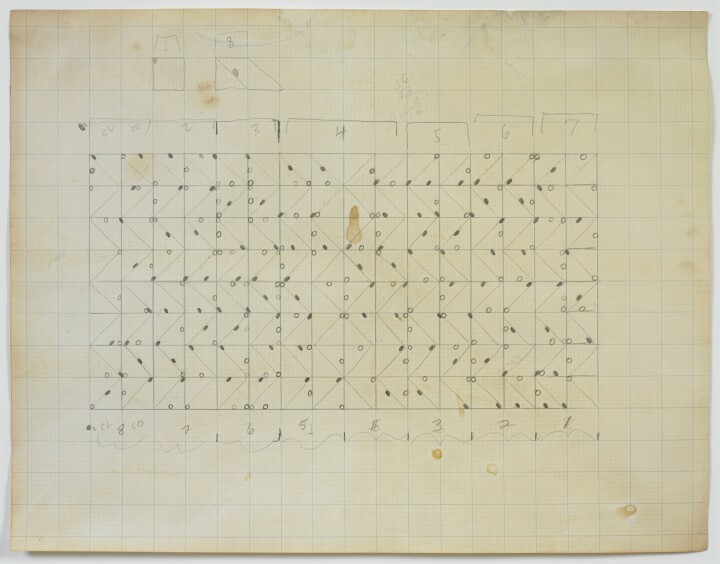 Larry Poons’s untitled pencil drawing of around 1964 (fig. 1) was made as a study for one of his signature dot paintings of the early 1960s. These paintings consisted of carefully calculated arrangements of dots (and later ellipses) on intensely saturated color fields, the opposing hues of object and ground generating an illusion of movement as well as a colored afterimage in the viewer’s eye. The execution of these works required intensive planning, as this drawing demonstrates. At art school in the 1950s, Poons was convinced that he could not draw: “I tried. But I found a way—or it found me, I suppose—where if I didn’t look at the paper, and didn’t look at what my hand was doing, and just looked at what I was drawing, I could do it much better than I’d ever done before.”1 He began organizing fields of dots and ellipses on a precise mathematical grid like the one in the present drawing, calculating not only the exact position that the shapes would occupy on the painted canvas but their optical trajectory for the viewer as well. The drawing is squared on graph paper, with the field of the projected painting divided into numbered sections along its upper and lower horizontal axes. Each square is neatly bisected by a diagonal line, alternating in direction with the lines above and below it to create a zigzag pattern. These lines would not be visible in the final painting, but their pattern is indicated by solid elliptical dots. Pointing along the diagonals, the lines of dots add to the directionality of the composition and to its sense of movement. Their shapes are interspersed, seemingly at random, with open circular dots situated on the horizontal and vertical axes of the grid. When transferred to canvas, the precisely positioned dots create the effect of an alternate pattern of movement, generating an optical illusion of space through the interaction of the two shapes, ellipse and circle. The presence of faint pencil lines, as well as smudges and what may be coffee stains on the sheet, reinforces the drawing’s status as a working diagram for a finished painting. Poons’s work is associated with both 1960s color-field painting and the emergence of Op art, a development focused on color, movement, and the psychology and physiology of perception. He stated that the much-cited afterimage that his paintings produce was at first an unintended effect of his intense palette of brash commercial colors,2 but he was quick to grasp the potential for this work to “explore and extend the range” of optical perception.3 Indeed, the visual experience of his color rhythms has elicited for some viewers an “almost kinesthetic response.”4 Poons has claimed inspiration for his abstract dot paintings from sources as diverse as astronomy—he enjoyed drawing constellations when he was young—and the “crisscrossing” movement of multitudes of pedestrians on Wall Street.5 His plotted diagram is evocative of these sources, offering a look into the artist’s thought process and his meticulous approach to art making. 1. Larry Poons, in Robert Ayers, “‘There’s No Gap between Seeing and Understanding’: Robert Ayers in Conversation with Larry Poons,” A Sky Filled with Shooting Stars (blog), February 25, 2009, http://www.askyfilledwithshootingstars.com/wordpress/?p=194.html. 2. Henry Geldzahler, “An Interview with Larry Poons, 1963,” in Making It New: Essays, Interviews, and Talks ([New York]: Turtle Point, 1994), 66. 3. James N. Wood, Six Painters (Buffalo, NY: Buffalo Fine Arts Academy, 1971), 11. Larry Poons (b. 1937, Tokyo, Japan) studied at the New England Conservatory of Music (1955-57) and the Boston Museum School of Fine Arts (1959). He has taught at Bennington College, Vermont (1968) and Cooper Union, New York (1971-72). Poons has been a guest lecturer at Yale University, Tufts University, Massachusetts College of Art, and the New York Studio School. He received the Francis J. Greenburger Foundation Award in 1988. Poons’ most recent solo exhibitions have been held at Bernard Jacobson Gallery, London (2007); Danese Gallery, New York (2007, 2009); and Jacobson Howard Gallery, New York (2007, 2008). His most recent group exhibitions have been held at the Columbus Museum of Art, Columbus, Ohio (2007); Freedman Gallery, Albright College, Reading, Pennsylvania (2008); the Boca Raton Museum of Art, Boca Raton, Florida (2008); the Frist Center for the Visual Arts, Nashville, Tennessee (2008); the Smithsonian American Art Museum, Washington, DC (2008); the Denver Art Museum, Denver, Colorado (2008); and Spanierman Modern, New York (2009). Poons lives in New York and teaches at the Art Students League, New York. Larry Poons, in Robert Ayers, “‘There’s No Gap between Seeing and Understanding’: Robert Ayers in Conversation with Larry Poons,” A Sky Filled with Shooting Stars (blog), February 25, 2009, http://www.askyfilledwithshootingstars.com/wordpress/?p=194.html. Henry Geldzahler, “An Interview with Larry Poons, 1963,” in Making It New: Essays, Interviews, and Talks ([New York]: Turtle Point, 1994), 66. James N. Wood, Six Painters (Buffalo, NY: Buffalo Fine Arts Academy, 1971), 11. Born in Berlin in 1956, Martin Noël trained in Cologne, becoming one of the leading figures of the Rhineland art scene in the 1970s. He was active in Bonn as a painter, draftsman, and printmaker in woodcut until his death in 2008. Transcendence has been described as a central theme of Noël’s work.1 These four drawings from the Freundlich series (figs. 1-4), executed in the year before his death, could be interpreted as reflections on an ideal or transcendent state, but they also display parallels with the use of seriality as a strategy in art of the 1960s and 1970s: the repetition or elaboration of a few elements in a process of continual, seemingly random realignment; the sense of infinite variability that this engenders; the works’ coherence as a group; and the notion of the progressive metamorphosis of a central theme in search of its ideal form.2 Devoid of the mechanical or systematic detachment particular to Minimal and Conceptual serial imagery, Noël’s work is organic, instinctual, and informed by his private vision. The drawings consist of four simple but mysteriously compelling compositions of horizontal and vertical lines intersecting at right angles, drawn freehand on standard-size postcards. The background colors of the postcards deepen gradually from off-white to slate blue-gray to a rich cornflower blue to an intense cobalt. The play of asymmetrical horizontals and verticals in the drawings varies subtly but markedly, each offering a different dynamic of just four lines in the first three images and of five in the fourth. The dominant vertical line shifts from the left in the first drawing to the right in the second, each with three horizontal branches extending to the outer edge of the postcard. The third drawing presents two equal horizontals that traverse the width of the card, supporting two shorter verticals, with an empty space occupying almost the entire lower half. A greater equilibrium in the length and placement of lines and in the areas that they define is achieved in the fourth drawing, giving a sense of unequal, opposing forces held in balance. The drawings’ depthless picture planes read either as lines precisely arranged on a field or as a field divided into irregular but complementary tesserae. Together with the deepening chromatic intensity of the postcards, the choreography of linear configurations suggests a progression through a series of increasingly powerful emotional states. This intensity is amplified by Noël’s elegant, febrile line. His touch is simultaneously tentative and assured; his expressive strokes, with their intricate junctions, are highly idiosyncratic. If this is a quest for transcendence, it is communicable only through strict abstraction, a condensation of reality to its essence. These are not diagrams for finished artworks, although they are closely related in composition to some of Noël’s large paintings; they are works of art in their own right, with the authority to exist independently as well as in series. Each individual work possesses, according to John Berger, “a unique, one-time-only, physical presence,” giving it the quality of a portrait.3 Each work is both a singular entity and an organic part of a larger whole. Noël’s drawings and the paintings to which they relate evoke associations with the natural world. This series suggests trees branching in Mondrian-like abstract patterns against a sky modulated by changing moods of light and shadow, or perhaps by the extensions of a moving human body. 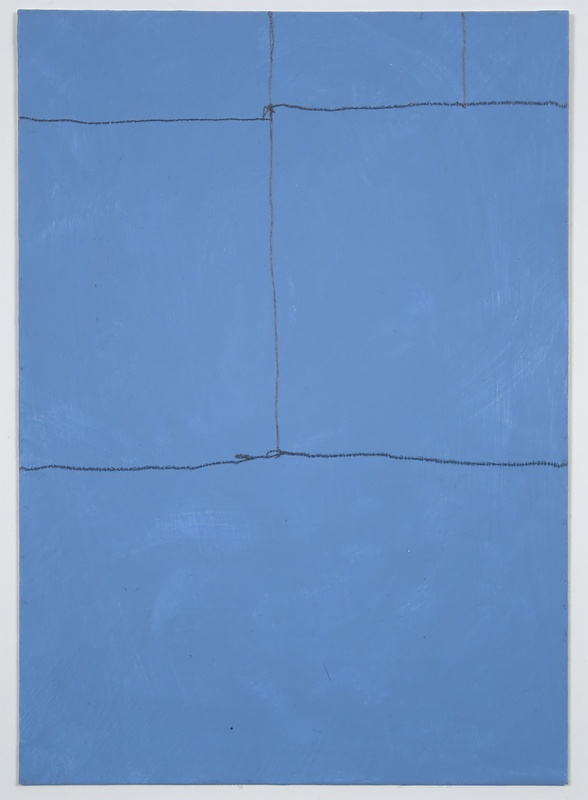 Meaning resides in the subtle variations among the works, in the changing directions of the lines that, as Berger observes, “are always leading somewhere else.”4 Where else is the question at the core of the works’ mystery. 1. See the artist’s website, http://www.martinnoel.de/werkauswahl/index.html. 2. Nicholas de Warren, “Ad Infinitum: Boredom and the Play of Imagination,” in Infinite Possibilities: Serial Imagery in Twentieth-Century Drawings (Wellesley, MA: Davis Museum and Cultural Center, 2004), 11. 3. John Berger, “Branching Out,” in Martin Noël: Blau und andere Farben, ed. Peter Dering (Ostfildern-Ruit, Germany: Hatje Cantz, 2003), 45–51. Martin Noël (b. 1956, Berlin; d. 2010, Bonn, Germany) studied graphic arts and painting at the Cologne University of Applied Science from 1980 to 1987. He received awards from the Scholarship of the City of Bonn (1986), the Max-Ernst Scholarship (1987), Scholarship of the Deutsche Studienzentrum Venice, Art Award The Young West (1991), the Art Prize of the City of Bonn (1993), the Perron Art Prize of the City of Frankenthal (1993), the Studio Grant of the LETTER Foundation Cologne (1998), the Scholarship of the Foundation for Art and Culture of the State of NRW (1998), and the Working Grant Kunstfonds Foundation (2003). Noël’s most recent solo exhibitions have been held at Galerie Contemporanea, Oberbillig, Germany (2008); MIWO, Bonn, Germany (2008); Sebastian Fath Contemporary, Mannheim, Germany (2009); Haus Beda, Bitburg, Germany (2009); Arp Museum Bahnhof Rolandseck, Remagen, Germany (2011); and Städtisches Kunstmuseum Spendhaus, Reutlingen, Germany (2012). His most recent group exhibitions have been held at Galerie Erhard Klein at HENN art, Maastricht, Germany (2008); Museum Morsbroich, Leverkusen, Germany (2008); Kunstmuseum, Bonn, Germany (2008); Galerie Ebbers, Kranenburg, Germany (2009); and Museum Pfalzgalerie, Kaiserslautern, Germany (2009). Noël lived and worked in Bonn-Bad Godesberg am Rhein, Germany. See the artist’s website, http://www.martinnoel.de/werkauswahl/index.html. Nicholas de Warren, “Ad Infinitum: Boredom and the Play of Imagination,” in Infinite Possibilities: Serial Imagery in Twentieth-Century Drawings (Wellesley, MA: Davis Museum and Cultural Center, 2004), 11. John Berger, “Branching Out,” in Martin Noël: Blau und andere Farben, ed. Peter Dering (Ostfildern-Ruit, Germany: Hatje Cantz, 2003), 45–51. In his 1967 essay “Paragraphs on Conceptual Art,” Sol LeWitt insisted on the primacy of the idea in the mind of the artist over the final artwork to which it led. The concept, he wrote, is the most important thing about the work; it is “the machine that makes the art.”1 Following LeWitt’s logic, any drawing or diagram produced by the artist is to be regarded as part of his thought process and thus occupies a privileged position in his oeuvre as a record of the artist’s ideas. Paradoxically, LeWitt stressed that his serial approach should not be regarded as rational, despite the formal logic of its visible expression: “Conceptual artists are mystics rather than rationalists. . . . Irrational thoughts should be followed absolutely and logically.”8 Both the incompleteness of his cubes and their apparently endless permutations have been read as signs of the deliberate—even parodic—irrationality of his systems, notably by Rosalind Krauss, who believed, as Nicholas Baume has remarked, that LeWitt demonstrated a worldview that was “skeptical of any claims to universal truths.”9 Readings such as this—alongside John J. Curley’s claim that the cubes’ incompletion signals, among other things, “the inability of scientific thought to restore wholeness to society”—imply that LeWitt may have knowingly played with the relationship between the rational and the irrational as a form of social commentary.10 His drawings and sculptures suggest a process of endless serial production that remains incomplete, even futile, for all that LeWitt continued to make them. 1. Sol LeWitt, “Paragraphs on Conceptual Art,” in Sol LeWitt: Critical Texts, ed. Adachiara Zevi (Rome: Libri de AEIUO, 1995), 78. 2. 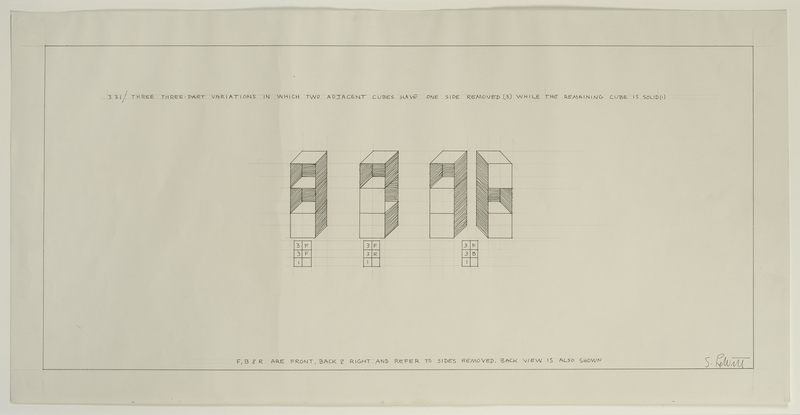 The drawing relates to an artist’s book by LeWitt: 49 three-part variations using three different kinds of cubes / 1967–68 (Zurich: Bruno Bischofberger, 1969). The book contains the prints 3-3-1 and 3-1-3, which are identical to two drawings in the Kramarsky collection: Three-Part Variations on Three Different Kinds of Cubes 331 (1967) and Three-Part Variations on Three Different Kinds of Cubes 313 (1968). 3. Sol LeWitt, “Sentences on Conceptual Art,” in Zevi, Sol LeWitt, 89. 4. Josef Helfenstein, “Concept, Process, Dematerialization,” in Drawings of Choice from a New York Collection, ed. Josef Helfenstein and Jonathan Fineberg (Champaign, IL: Krannert Art Museum, 2002), 14. 5. Sol LeWitt, “Serial Project No. 1 (ABCD),” in Zevi, Sol LeWitt, 76. 6. Sol LeWitt, “The Cube,” ibid., 72. 7. LeWitt, “Serial Project No. 1,” 76, 75. 9. Nicholas Baume, “The Music of Forgetting,” in Sol LeWitt: Incomplete Open Cubes, ed. Nicholas Baume (Hartford, CT: Wadsworth Atheneum Museum of Art; Cambridge, MA: MIT Press, 2001), 21. 10. John J. Curley, “Pure Art, Pure Science: The Politics of Serial Drawings in the 1960s,” in Infinite Possibilities: Serial Imagery in Twentieth-Century Drawings (Wellesley, MA: Davis Museum and Cultural Center, 2004), 33. 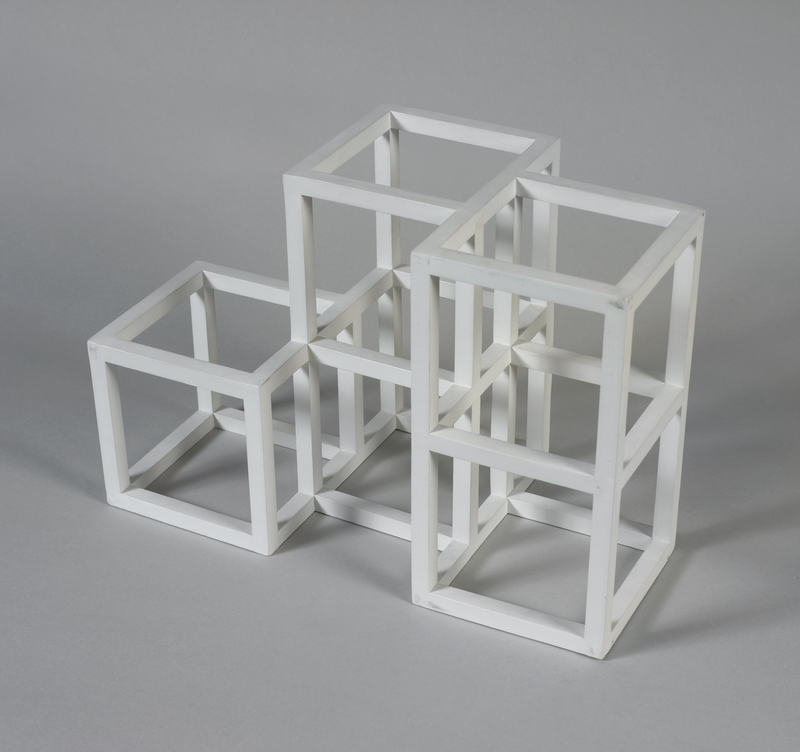 Sarah Louise Eckhardt observes that the cubes’ potential for variation reveals the subjective arbitrariness of LeWitt’s decisions, subverting his systems’ apparent order. 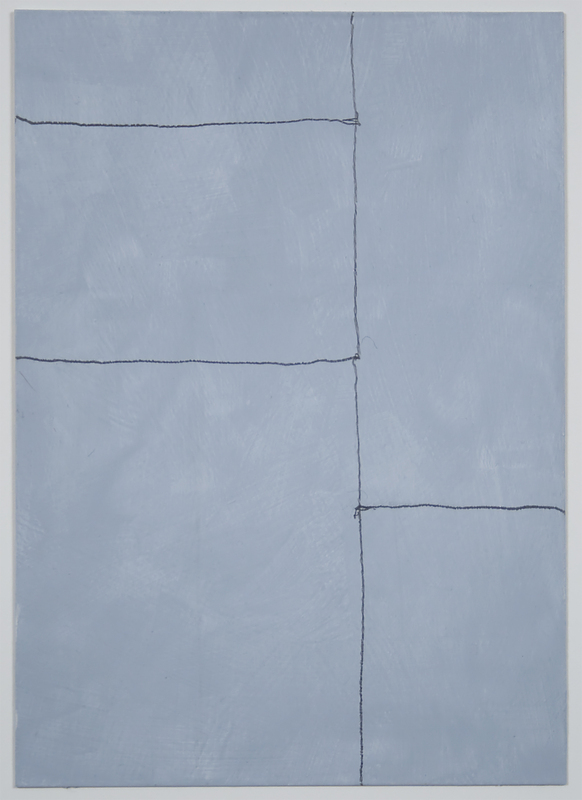 Sarah Louise Eckhardt, “Sol LeWitt,” in Helfenstein and Fineberg, Drawings of Choice, 82. Sol LeWitt (b. 1928, Hartford, CT; d. 2007, New York, NY) earned his BFA at Syracuse University, New York, in 1949. LeWitt’s work has been the subject of hundreds of solo exhibitions in museums and galleries and is represented in the collections of major museums worldwide. Retrospective exhibitions have been held at numerous venues, including The Museum of Modern Art, New York (1978); the Stedelijk Museum, Amsterdam (1984), the Tate Gallery, London (1986); and the Kunsthalle Bern, Switzerland (1989). The most recent retrospective of LeWitt’s work was organized in 2000 by the San Francisco Museum of Modern Art, California, and traveled to the Museum of Contemporary Art, Chicago and the Whitney Museum of American Art, New York. Other solo exhibitions have been held recently at Metropol Kunstraum, Munich (2007); the Wadsworth Atheneum Museum of Art, Hartford, Connecticut (2010); MASS MoCA, North Adams, Massachusetts (2011); Museum Wiesbaden, Germany (2012). LeWitt’s wall drawings were installed in the Riggio Galleries at Dia:Beacon, New York, in 2006. In 2008, a wall drawing retrospective was installed at the Massachusetts Museum of Contemporary Art, North Adams, in partnership with the Yale University Art Gallery in New Haven, Connecticut and the Williams College Museum of Art in Williamstown, Massachusetts; this installation will remain on view for 25 years. LeWitt lived and worked in New York City, where an installation of his three-dimensional structures, organized by the Public Art Fund, was on view in City Hall Park through 2011. Sol LeWitt, “Paragraphs on Conceptual Art,” in Sol LeWitt: Critical Texts, ed. Adachiara Zevi (Rome: Libri de AEIUO, 1995), 78. The drawing relates to an artist’s book by LeWitt: 49 three-part variations using three different kinds of cubes / 1967–68 (Zurich: Bruno Bischofberger, 1969). The book contains the prints 3-3-1 and 3-1-3, which are identical to two drawings in the Kramarsky collection: Three-Part Variations on Three Different Kinds of Cubes 331 (1967) and Three-Part Variations on Three Different Kinds of Cubes 313 (1968). Sol LeWitt, “Sentences on Conceptual Art,” in Zevi, Sol LeWitt, 89. Josef Helfenstein, “Concept, Process, Dematerialization,” in Drawings of Choice from a New York Collection, ed. Josef Helfenstein and Jonathan Fineberg (Champaign, IL: Krannert Art Museum, 2002), 14. Sol LeWitt, “Serial Project No. 1 (ABCD),” in Zevi, Sol LeWitt, 76. Sol LeWitt, “The Cube,” in Zevi, Sol LeWitt, 72. LeWitt, “Serial Project No. 1,” 76, 75. Nicholas Baume, “The Music of Forgetting,” in Sol LeWitt: Incomplete Open Cubes, ed. Nicholas Baume (Hartford, CT: Wadsworth Atheneum Museum of Art; Cambridge, MA: MIT Press, 2001), 21. John J. Curley, “Pure Art, Pure Science: The Politics of Serial Drawings in the 1960s,” in Infinite Possibilities: Serial Imagery in Twentieth-Century Drawings (Wellesley, MA: Davis Museum and Cultural Center, 2004), 33. Sarah Louise Eckhardt observes that the cubes’ potential for variation reveals the subjective arbitrariness of LeWitt’s decisions, subverting his systems’ apparent order. Sarah Louise Eckhardt, “Sol LeWitt,” in Helfenstein and Fineberg, Drawings of Choice, 82. One of the leading practitioners of Minimal art, Dan Flavin was known from 1963 until his death in 1996 for his sculptures and installations made from fluorescent light fixtures and other commercially available materials. 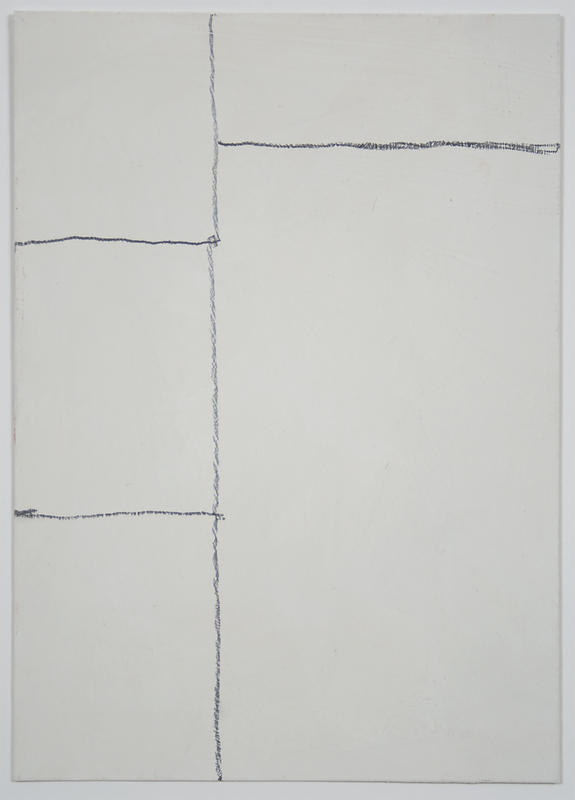 Made in 1973 for an installation at the John Weber Gallery in New York, this group of four working drawings (fig. 1) anatomizes Flavin’s method of working with fluorescent tubes to create installations in which light defines and transfigures space. The annotated drawings trace the progression of the artist’s concept from its initial trial layout to the final articulation of the installation, functioning both as records of his thought process as he elaborated and changed his design and as diagrams for the construction of the work. 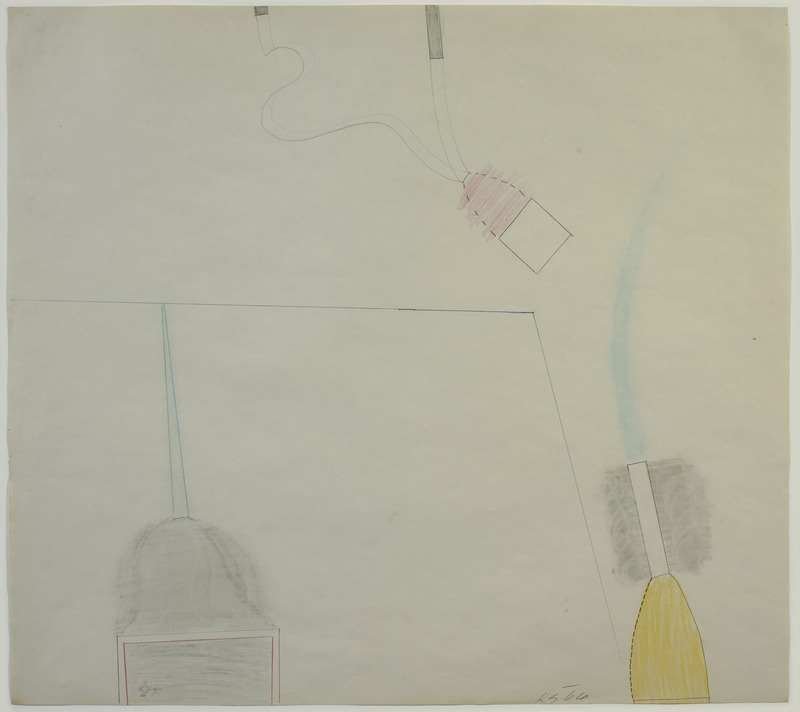 The drawings thus enable the viewer to follow and comprehend, in several stages, Flavin’s unique creative path. 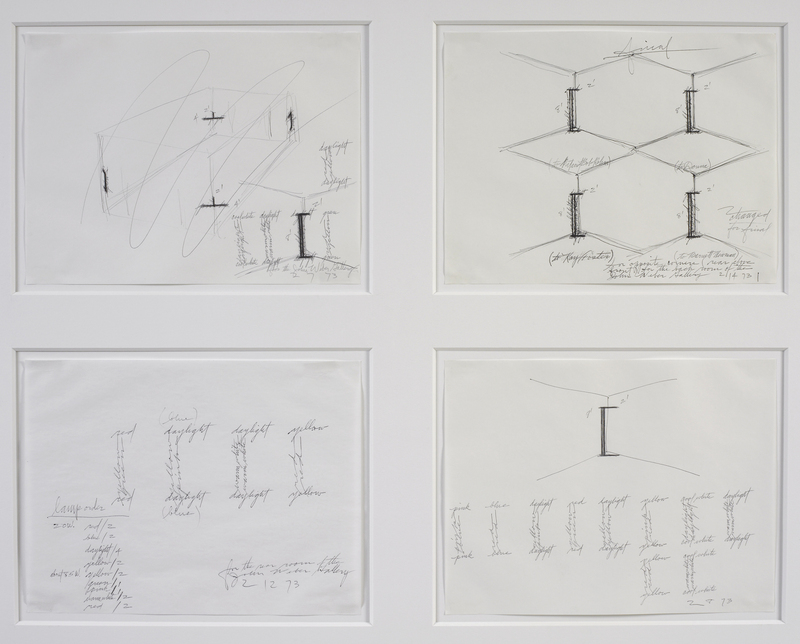 The three earliest drawings show various projected arrangements for the light-tube assemblages, annotated with dimensions, wattage values, potential color combinations, and locations in the corners of the room. One room layout is scrawled over, marked as rejected. In the fourth drawing, headed “final,” several corner placements are arrayed in a decorative pattern, their perspective angles forming a grid of open and closed diamonds and hexagons. This is simultaneously instructive, aesthetically pleasing, and visually deceptive; the drawing’s aesthetic qualities work against its utilitarian nature as a technical diagram. Referring to the arrangement of the light fixtures, Flavin said, “I never neglect the design.”2 Here he established a tension, also apparent in the finished artwork, between its aesthetic effect and the industrial materials and method of its construction. Handwritten text is integral to each drawing, providing technical instructions and serving as a structural component. Flavin constructed the forms of his light-tube assemblages from the words that indicate the colors of their lamps: red, yellow, green, pink, blue, daylight, warm white, and cool white. The written words have a double signification, indicating both the color of the light to be produced and the form of the object producing the light. Flavin made language a surrogate for object, privileging the conceptual over the physical nature of the artwork in drawings that chart the concept’s evolution. The trials, rejections, and hesitations that these drawings acknowledge emphasize process, exposing the role of contingency and choice in Flavin’s mode of creation. These rapid working sketches on common notebook or typing paper were essential to his methodology. He made his drawings as a means of thinking through and recording his installations, but for the viewer they elucidate the relationship of the artist’s working process to his finished work. 1. Dan Flavin, quoted in Isabelle Dervaux, Dan Flavin Drawing (New York: Morgan Library and Museum, 2012), 113. 2. Dan Flavin, “Some Other Comments . . . ,” Artforum 6 (December 1967): 23, quoted in Eun Young Jung, catalog entry for Jill’s Red Red and Gold of December 9, 1965, in Drawings of Choice from a New York Collection, ed. Josef Helfenstein and Jonathan Fineberg (Champaign, IL: Krannert Art Museum, 2002), 44. Dan Flavin (b. 1933, Queens, NY; d. 1996, Riverhead, NY) was trained as a meteorological technician by the United States Air Force before studying at the University of Maryland Extension Program in Osan-ni, Korea. He attended the New School for Social Research, New York (1956) and Columbia University, New York (1957-1959). Flavin’s first solo exhibitions were held at the Judson Gallery (1961) and the Green Gallery (1964), both in New York. In 1969, the National Gallery of Canada, Ottawa, organized his first major museum retrospective. 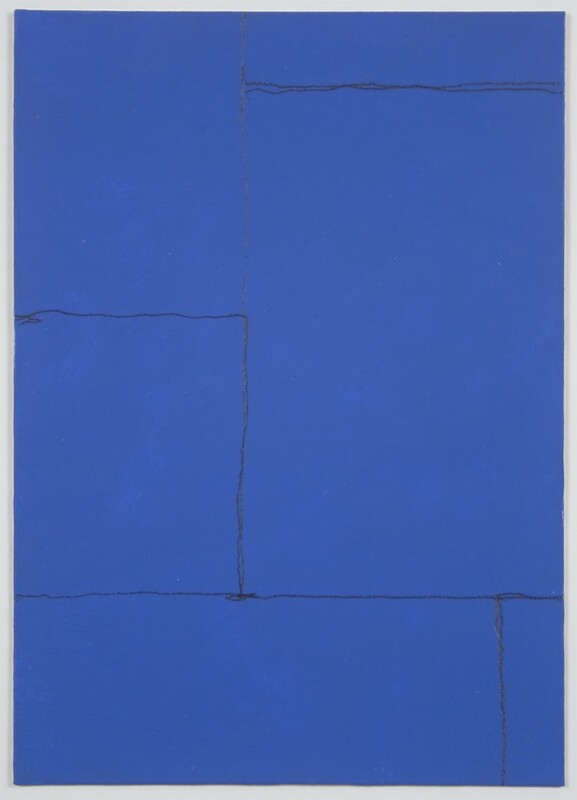 His work was included in a number of key early exhibitions of Minimal art in the 1960s, among them Black, White, and Gray, Wadsworth Atheneum Museum of Art, Hartford, Connecticut, 1964; Primary Structures, The Jewish Museum, New York, 1966; and Minimal Art, Gemeentemuseum, The Hague, 1968. The Dia Art Foundation opened the Dan Flavin Art Institute in Bridgehampton, New York, in 1983. His work was permanently installed in the Dan Flavin Gallery at the Menil Collection, Houston, Texas in 1998. In 2004, a retrospective was organized by the National Gallery of Art, Washington, D.C., in association with the Dia Art Foundation, and traveled to the Modern Art Museum of Fort Worth, Texas; the Museum of Contemporary Art, Chicago; the Hayward Gallery, London; the Musée d’Art Moderne de la Ville de Paris; the Pinakothek der Moderne, Munich; and the Los Angeles County Museum of Art, California. Recent solo exhibitions have been held at the The Pulitzer Foundation for the Arts, St. Louis, Missouri (2008); Zwirner & Wirth, New York (2008); David Zwirner, New York (2009); Paula Cooper Gallery, New York (2010); and The Morgan Library and Museum, New York (2012). Flavin lived and worked in New York. Dan Flavin, quoted in Isabelle Dervaux, Dan Flavin Drawing (New York: Morgan Library and Museum, 2012), 113. Dan Flavin, “Some Other Comments . . . ,” Artforum 6 (December 1967): 23, quoted in Eun Young Jung, catalog entry for Jill’s Red Red and Gold of December 9, 1965, in Drawings of Choice from a New York Collection, ed. Josef Helfenstein and Jonathan Fineberg (Champaign, IL: Krannert Art Museum, 2002), 44.